When I made this graphic, I was intending to offer advice on managing stress or things that you can do to add hapiness into stressful times. And then when I sat down to actually write this post, those weren't the words that started to stir inside of me. I decided that I didn't want to pretend to have all the answers or that life was rainbows and flower fields at the moment. I just decided to be simply honest. Stress seems to be the common theme in my life recently. I am always two steps behind everything I need to be doing. I know that this is partly (mostly) my fault due to my nature as a procrastinator. I don't know how I became one, but I haven't been able to break that habbit (New Year's resolution?). In the past, I have been able to get away with it and still be successful, but things have been catching up with me this semester in particular. I realize that I have felt so stressed due to my overly planned schedule. I am a full-tume student and am working around 25 hours per week. Two days a week, I go to school from 8am-2pm, work from 2:230-6pm, and then head to an evening class from 6:30-9pm. The other days, I work from 9am-1pm, and then again from 2:30pm to 6pm. And then, of course, it takes me 30+ minutes to fight traffic all the way home. It has been increasingly depressing as it has been getting dark so early. As I say this all outloud and compare myself to other college students, I am starting to think that I am crazy. Yet, at the same time, I know that I will be better for it in the long-run, unlike Facebook "friends" I know off living the partying life on their parents' dime. Part of the consequence for my overly planned schedule is lack of time just for myself. I am the type of girl who needs time to be alone, cuddled up in bed with my sweet pup, or spending time in a hot shower with candles. Or even blogging. This little blog is my creative outlet, which is a natural stress reliever for me. So, when I do have free time, I choose to take in these moments instead of starting my English paper, or studying from my Biology textbook. Can you blame a girl? I don't necessarily know where I am going with this, but I guess this is all to say that life goes on. This semester from hell will be over in four weeks, and then I will have a month-long break to work on this space that makes me truly hapy from the inside out and work on the finishing touches of a project I am beyond excited to share with you all. Life seems impossible right now, but it will go on. I will get through this and I am stronger than I think. I think this is also to say that it is important to take the time to do things for yourself, even if other obligations are looming. Classes, work, and other responsibilites will always be calling, but you are useless to them if you feel empty. So, please take the time to do something that makes you happy. Turn off your brain for a while and forget all that is on your to-do list. It will be there when you are done. And if not, life will go on and you will be just fine, this I promise you. Hi Jess! Sorry to hear that your life is stressful at the moment. I've been where you are; studying law and psychology full time, and working 20+ hour weeks... stress was a constant. But this year I've been doing wayyyyyy less, seeing as I've graduated, and have been too unwell to get a job. 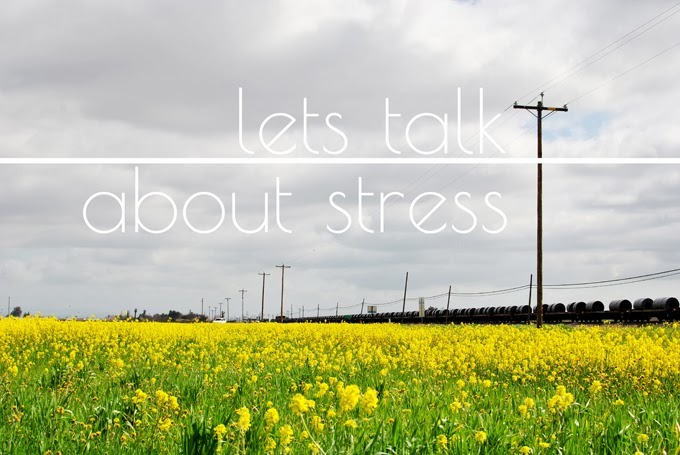 Somehow, it's still pretty stressful... perhaps some people are just stress-ier than others? If nothing else, I seem to function quite well in high pressure situations, thanks to my experience battling stress. Perhaps that's an upside to your busy life right now? That in the future you'll be the most awesome person to have around in a crisis? Very small silver lining there. Thanks for sharing! Thanks for your kind words, Lauren! I definitely have been listening to my favorite Jack's Mannequin album really loudly while stuck in traffic haha I know all the words so I sing along with everything I have. Sometimes people stare, but whatever lol. Thanks for stopping by! Wow! Law and psychology?! What a load! I am sorry to hear that you are not well. I can't imagine how tough that must be. I think you are right. We do make great people to have around in a crisis! That's a nice way to look at it :) Thanks for stopping by! Yes, I absolutely LOVE Jack's Mannequin! Will forever be one of my favorites :) Always nice to meet another fan! !